With their fronds and lace-like leaves, ferns can thrive in your outdoor landscaping and compliment trees, flowering shrubs, and other outdoor plants. About 12,000 species of ferns grow around the world in various habitats. Many are suitable for the garden. The Boston fern, staghorn fern, and others can even live indoors. 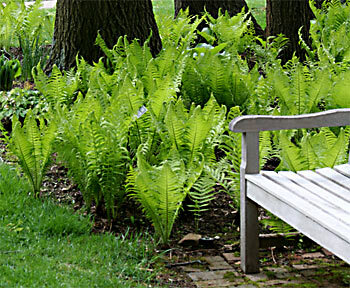 The fern comes in many varieties that will add definition and interest to your landscaping. Ferns look amazing planted behind other smaller plants like the Variegated Hosta. If planted full and thick enough they will create the most beauitful back drop. Each variety of fern thrives in dappled light created by tree branches they way they grow in the forest. Try to simulate these conditions when you plant them in your landscaping. Keep in mind that the more direct sunlight the fern gets, the more moisture it will require. However, fern plants can survive brief dry periods making them especially easy to care. Mulch around the fern plant with finely shredded leaves or leaf mold. This will mimic the conditions of the natural forest floor. Adding a layer each spring will help them retain moisture through the heat of summer. Since the fern is a shallow-rooted plant, weed around them carefully watching for any sprouting fiddleheads. You don't have to worry about supplemental fertilizers for the fern plant. Compost and leaf mold mulch provides all its necessary nutrients. There is also no need to cut them back in the fall. The fronds will protect the crown over the winter. As long as you mimic the fern plants' natural conditions, you can grow them lushly in your garden with a minimum amount of care. Fern Plants are shipped year round. They are bare root and ready to plant and we guarantee they will grow or your money back. Wholesale fern plants are the way to go!